With the warm weather rolling in, you'll be spending your as much of your free time as you can outdoors. Whether that's sitting by the pool or in the shade reading a book, you'll want your outdoor furniture looking pristine! We all know how the powerful rays of the sun can discolor your patio furniture and cushions, making them look old and worn out. Here at Furniture Clinic, we want all your furniture to look and feel as if they were brand new all the time! 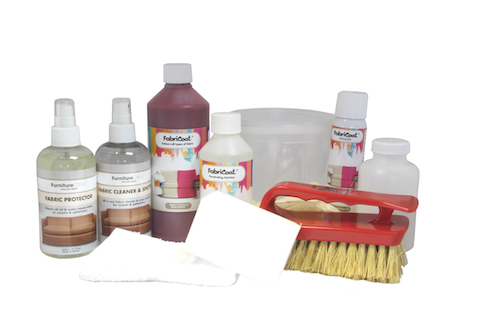 Follow these tips on how to use our FabriCoat Upholstery Kit to help clean, re-color, and protect your outdoor fabric furniture from all the elements this summer season! To clean your fabric goods, simply spray on the Fabric Cleaner & Spotter until the surface appears wet, agitate well with a Tampico Brush and allow to dwell for 5 minutes. After allowing to sit, take a lint free cloth and firmly wipe the area down, this will draw the dirt out of the fabric. Repeat this process until you no longer see dirt being transferred onto the cloth. After cleaning you should leave the item to dry thoroughly. When changing the color of an item, it is important to note that you should only use this kit to change to a darker color. The material must also be absorbent, it is unlikely that the FabriCoat will properly adhere to a non-absorbent fabric. You will want to thin the FabriCoat down with Penetrating Solution using the bucket provided, this will help penetration into stubborn fibers. Then you'll attach the feed tube to the bottom of the FabriCoat Sprayer by firmly pushing the end without the plastic fixture into the bottom of the sprayer. Pour the FabriCoat into the plastic bottle provided and screw this onto the bottom of the FabriCoat Sprayer until secure. Ensure that the bottle is properly secured, while taking care not to over-tighten as this can cause the bottle to become loose. Now the fun begins! 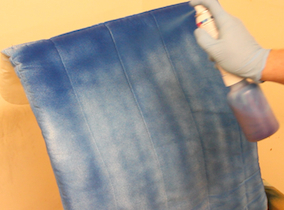 Simply press down on the head of the sprayer to begin applying color to your fabric item. For the best results, spray the FabriCoat onto the item using straight regular strokes moving from one end of the panel to the other. Once an initial coat has been applied this step should be repeated from different directions to ensure proper surface coverage. If at any point the FabriCoat in the bottle you are using, or the propellant in the can, runs out, simply unscrew it, refill the bottle and re-attach, or simply attach a new sprayer. When you have achieved the desired color of your furniture, let dry for 4 to 8 hours depending on saturation and environment. When dry, apply the Fabric Protector generously to the entire surface of the item, spraying until the surface appears wet, and leave for 24 hours to dry before use. This will repel all water and oil based staining while the UV inhibitors in the formula work to prevent the color from fading in direct sunlight. With your newly restored fabric furniture, you will now want to keep up with general maintenance to help keep your fabric clean and protected. 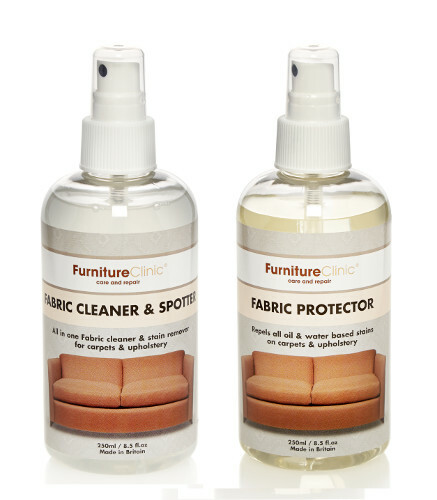 We recommend our Fabric Care Kit which comes with both our Fabric Cleaner & Spotter and our Fabric Protector as your maintenance kit for all your fabric goods. You can now enjoy your favorite fabric furniture without the hassle and cost of having to replace items every year! Cheers to summer 2017!